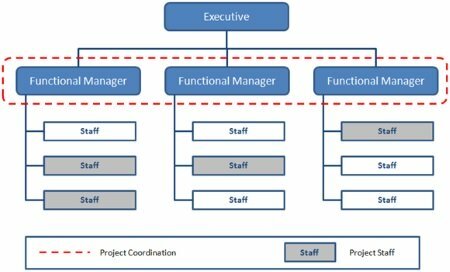 Different organizational structure types will affect various aspects of your project and will require you to adjust your management approach accordingly. Organizational structure refers to the way a company or organization is setup. It is usually defined using a hierarchy chart that shows how groups or functions report within the organization. 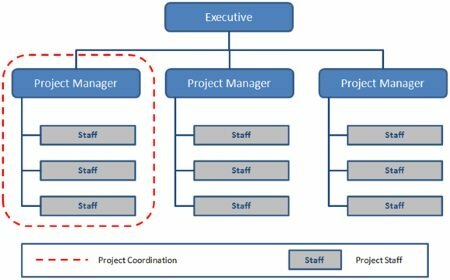 For Project Managers, a company's organizational structure type will affect how resources are allocated to the project and will be a factor in how much influence the Project Manager will have within the organization. Functional organizations are structured around the organization's primary functions. In a functional organization, every employee is positioned within only one function and has one manager they report to, the Functional Manager. The Functional Manager assigns and manages the employees work and handles administrative tasks such as employee compensation. Project-based organizations are structured around projects and not functions. This type of structure is also called a projectized organizational structure. In a project-based organization most of the organization's resources are involved in project work. Project Managers have high levels of independence and authority for the project and control the project resources. Matrix organizations blend features of project-based and functional organizational structures. The key challenge with a matrix organization is that every employee has two (or more) managers they report to, their Functional Manager and the Project Manager. If they are working on multiple projects, they may have even more managers to report to. A weak matrix organizational structure maintains many of the features of the functional organizational structure. 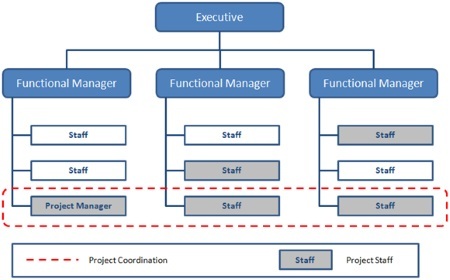 The role of the Project Manager is more that of a Project Coordinator. Their ability to make or enforce decisions is low and most of the authority remains with the Functional Manager. A balanced matrix organizational structure recognizes the need for a Project Manager. However, the Project Manager does not have full authority over the project, project staff or project budget. A strong matrix organizational structure has many of the features of the projectized organizational structure. They have full-time Project Managers and project administrative staff. Project Managers have considerable authority over the project in this organzational structure. Two of the key project aspects affected by organizational structure types are Project Manager Authority and Resource Availability. As you move across the spectrum from Functional to Matrix to Project-Based organizational structure types, the organization will move from favoring ongoing operations to favoring projects. On the left side of the spectrum are Functional Organizational Structures. As a Project Manager, you will have limited positional authority in these type of organizations. You will need to rely on expert authority and referent authority to get project tasks completed. Because of this, you will need to develop your influencing and negotiating skills if you want to be successful. From a Resource Availability perspective, you will be dependent on the Functional Managers in your organization to provide you with resources. In these cases, the project resources will report indirectly to you. On the right side of the spectrum are Project-Based Organizations. As a Project Manager, you will have more positional authority the further right your project sits on the spectrum. This doesn't mean you can just command others, but you will have more formal authority for getting project tasks completed. From a Resource Availability perspective, you will also have greater control over your project resources since they will be more likely to directly report to you and not to a functional manager. Understanding what type of organizational structure is used by your company will help you determine how you should manage your project. These project management principles will help you build a strong foundation from which to manage your projects. Learn how you can use these fundamentals to ensure your projects succeed. What is project management? Going beyond your typical definition of project management, find out why project management is exhilarating, challenging, and inspiring. The project management life cycle provides a framework for managing any type of project. From Project Initiation to Project Closure, learn the key aspects about each phase of the project life cycle. Understanding key project manager duties will help you lead your projects successfully. 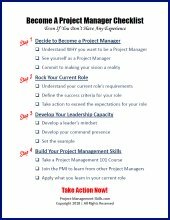 Using the four functions of management, learn about the main responsibilities and duties of a project manager. Do you want to avoid project management failure? Learn three critical tips that will significantly increase your ability to achieve project management success.